I'll be filling in all the usual info tomorrow (probably today, as you read this), but I wanted to get these posted out tonight to keep my full 3 images limit tomorrow (my time). For now, let's just say that this is a fairly small but prominent part of a common critter. Anyone want to take a guess what? Hmmm... some of those hairs looks like a feathers. Rik, aren't you sure we have a mutant here? Well the shape is somewhat reminiscent of a scorpion's tail, but then I'm sure it wouldn't possess such a complex array of feathery bristles (in fact have any bristles at all). Maybe from a water scorpion or scorpion fly? Ok my not very confident guess is tail of scorpion fly. some sort of mouth part or tounge? Those hairs grab your attention, don't they? They sure did mine. But only after I made this image. Before that, I never even noticed them, despite more than a few minutes working with this specimen under a dissecting scope trying to figure out a good angle to shoot it from, and then to get it mounted. I don't want to put this subject back under the microscope for a while, until I'm done photographing it. So I can't say how visible the feathering is under the scope. It's very possible I just had my attention focused on the shapes of the sclerotized parts in the main bulb. But just now, I looked over the rest of the body that gave up this part, and I still can't get my eye on any feathered hairs. Nope. This is a common critter. I can't recall ever seeing a live scorpion fly. But the chances are quite good that I could find one of these things, or at least a close relative, on any day of the year -- and I live in an area where things freeze solid in winter. Sort of, but that's not its most notable function. In particular, it's from the right side of one of the house spiders that live in the corners and crevices of my basement and garage. I'm not sure if they're all the same species, or where this particular specimen came from. Kinda pervert spider. This one likes young chickens! It was a lucky guess. I know Rik has been doing a lot with spiders lately. Did I say an incredable photo Rik. 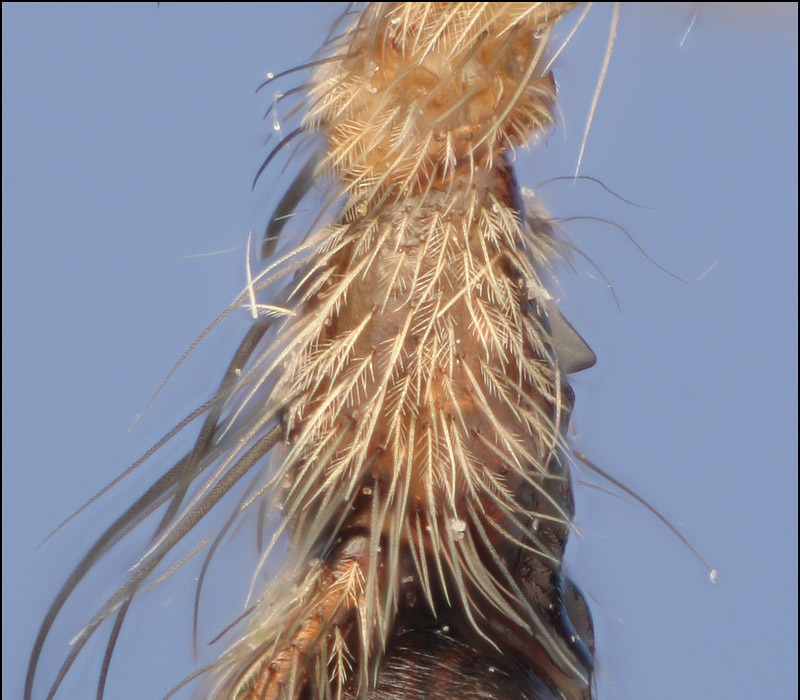 That is a pretty neat photo though, you can see the scales on the hairs if you look close. Thanks for the looks and comments, everybody! Ken, those various bristles sure have a lot of different textures, don't they? There are a few around the center of the bulb that actually seem to be serrated, although that doesn't show up very well at this scale. 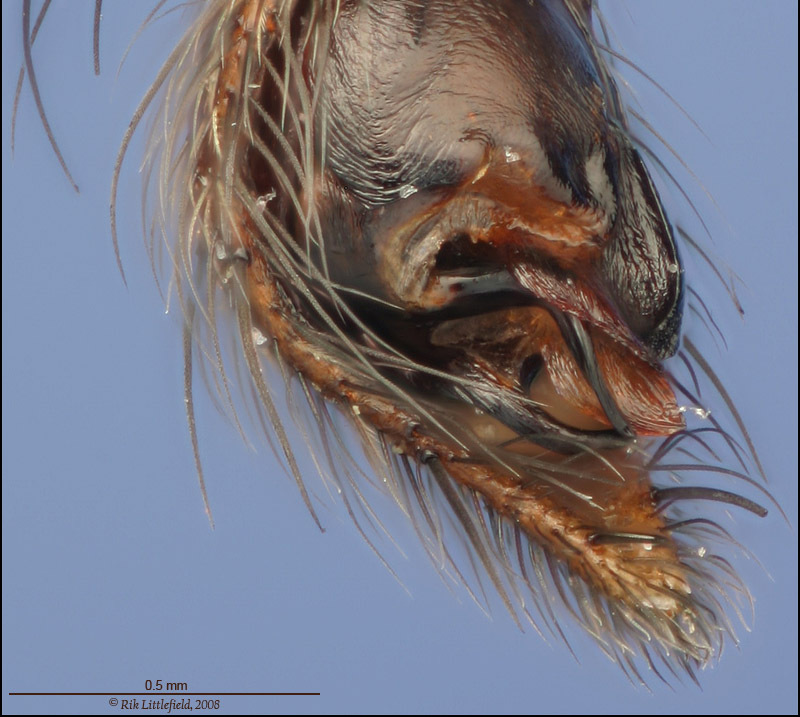 Maybe I'll go in with a microscope objective and see if I can get that feature more clearly. I'm afraid that this topic will be evolving for a bit. I ended up doing a lot of other stuff today instead of working on this subject. 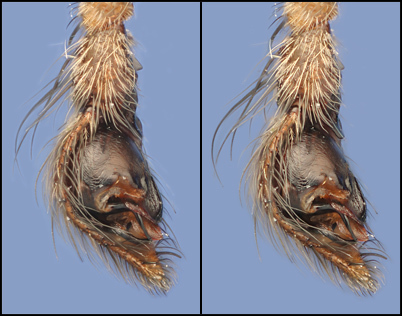 But for those of you who can see stereo, here are a couple of shots that will help to reveal the complicated structure of this thing. 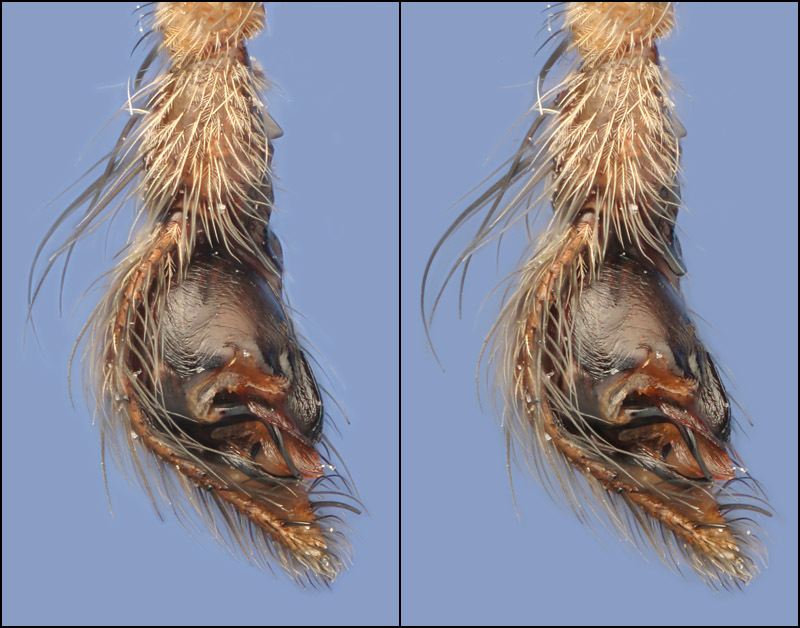 I think these stereo pairs are very cool, because try as I might, I could not make out as much structure working real-time under a stereo scope, as I can in these static pairs. I'm not sure why that is -- I think it's a combination of resolution, DOF, and lighting. I haven't figured out yet how to get pingpong quality lighting in real-time view, and still be able to fly the specimen around. In any case, enough ramblings -- on with the pictures! Crossed-eye, large then small, no difference except size. I recommend the large one if your eyes will handle it. BTW, I don't have precise scale on this thing yet, but as near as I can tell, frame height is just a hair over 2 mm in the stereo views. Technical: Canon 300D, 38mm f/2.8 Olympus bellows lens at f/4, 70 frames per view, stacked at 0.0007" focus step. Dual fiber halogen illuminator at low intensity, 5 seconds per frame exposure. Stacked using Helicon Focus with some manual touchup. Background is printed paper, pushed to exactly the same shade of uniform blue with Photoshop masking. Edit Jan 12, 2008: Actual measurement is 1.89 mm frame height in the stereo views. Scale bar added to bottom image in first post. Superb images, tremendously rich in detail these are, Rik! And both of the stereo pairs are working excellently too. The small ones were no problem from the very start. Though, the large ones took me a couple of minutes to achieve the overlap. It worked after I had figured out not to have my nose too close to the screen. At a distance face-screen > 70 cm my eyes could finally cope with the large pair as well.